I look if ever I want another car. Bought my wonderful mini off Tracey and I love it. Had a few problems early on but she fixed them without trouble! Would buy another mini again from her. I reserved my mini on line as was working overseas. Collected on my return to the UK and am absolutely delighted with my Cooper convertible. Tracey was so easy to deal with and the whole process was very efficient. My Mini Cooper was exactly as described and I could not be more pleased. Highly recommend. Had the pleasure of dealing with Tracey to buy my mini. She was not pushy and really knew her stuff about cara. Was very helpful with trading in my car and was very fair. Would highly recommend. My mini was in immaculate condition and Tracey told me to contact her should I have any problems. So nice to buy from a non pushy dealer who takes the time to explain everything to you in detail. Tracey knows her stuff and organised for parking sensors to be fitted to my car. She was also able to help out when I couldn't collect my car immediately and totally got my nostalgia about selling my old banger. Would highly recommend. 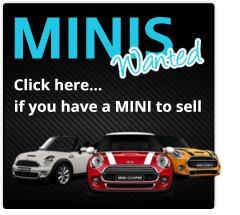 August 2018 - Easiest transaction in selling my mini to Tracey. Very friendly, professional,and no messing about. Fantastic. Thank you. Thank you Tracey for fantastic customer service, extremely professional, very friendly, honest...and a fantastic lady in general! I’m over the moon with my new beautiful Cooper Countryman! I will be definitely revisiting in few years when I ready for my next upgrade!